Woo-hoo! It's that time of year . 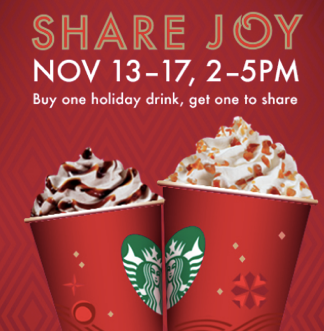 . .
Starbucks is bringing back their incredibly popular Buy One, Get One Free Holiday Drinks offer again this week. From 2 to 5 p.m. on November 13-17, 2013, you can get a free Holiday Beverage when you purchase another Holiday Beverage.